The Strong Interest Inventory® is an on-line Holland Code assessment that helps you identify - Interests Holland Codes Careers. 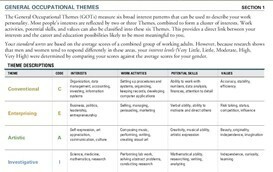 Basic Interest Scales point to work activities, projects, course work, and leisure activities that are personally motivating and rewarding. The Interest Scale Levels are Very Little, Little, Moderate, high, and Very High. 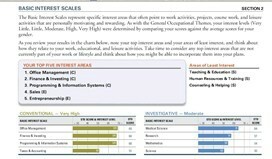 Your Basic Interest Scales Report will give you your TOP FIVE Interest Areas and the Areas of Least Interest. Occupational Scales – Comparison of your likes and dislikes with those people who are satisfied working in various occupations. 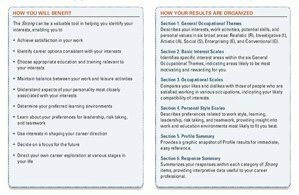 The Occupational Scales matches your interests to 122 occupations. Your score matched the likes and dislikes of people who are working in and are satisfied that career. The occupations are an example of a larger job cluster. The TOP TEN Occupations are the careers that most closely match your interests. Within each Holland Code Theme, you will find careers that you are Dissimilar, Midrange, or Similar to your score, likes, and dislikes. The report outlines Similarity to Occupations. Once you are transferred to the Strong Interest Inventory web site https://online.cpp.com, you enter your User Name and Password, and access to the web site is immediate.